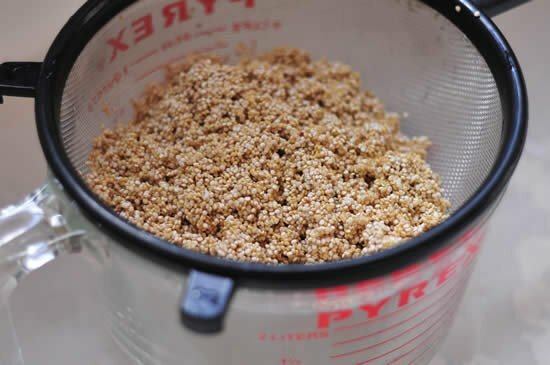 Quinoa (pronounced Keen-Wa) is a spectacularly impressive grain. For such a tiny little guy, he’s packed with nutrients, and it’s even been said that you can survive on nothing but quinoa, although I wouldn’t recommend trying it. Quinoa is not only a complete protein, it is also packed with iron, copper, zinc, magnesium, folate, lysine, and other essential amino acids. 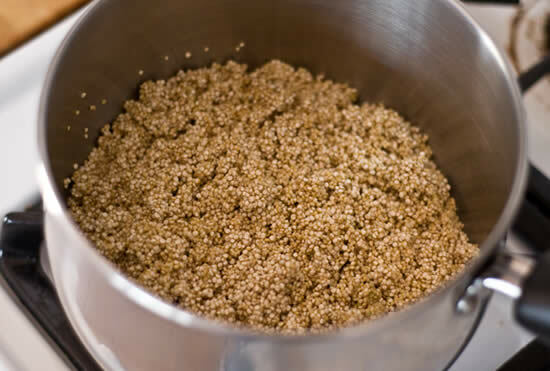 Along with a dose of fiber and zero saturated fat, quinoa is an incredible addition to any diet. 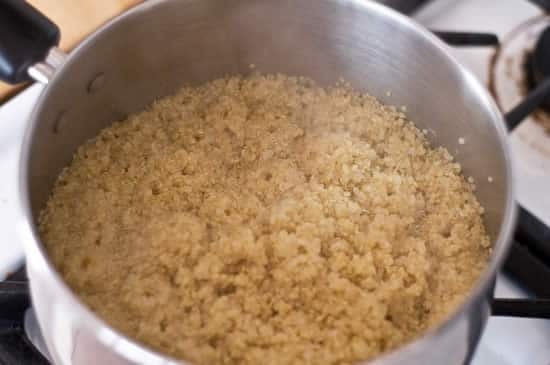 So, now that you are completely on board with a heaping spoonful of quinoa, how can you cook it without making a bowl of mush? I’m so glad you asked. There are a few basic steps to make fluffy quinoa that, in most cases, are inexplicably left off the package directions. For this lesson in quinoa cookery, I am making 2 cups. Quite a large amount, but in the interest of saving time throughout the week, I like to make a large batch on Sundays and have it ready to go for the next 3-5 days. 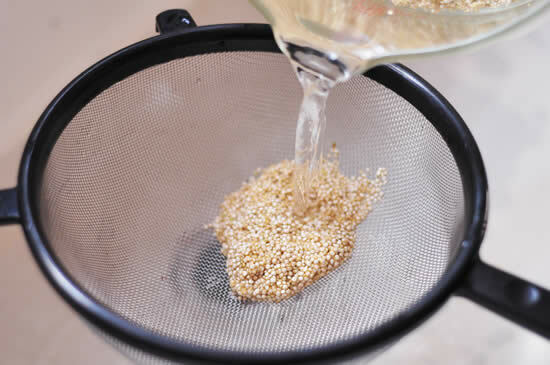 First, don’t forget to rinse your quinoa. Think of this like remembering to wash your hands before eating, you really have no idea what could be on those little grains. Put 2 cups of quinoa in a bowl that will hold at least 6 cups. 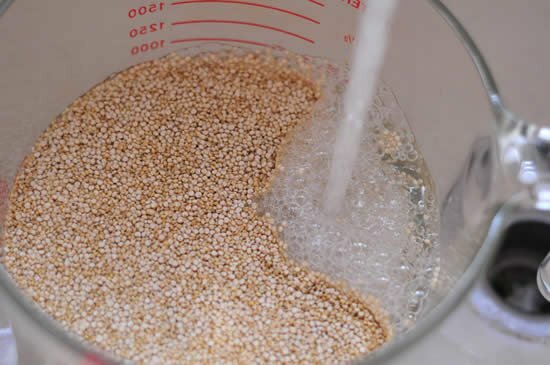 Cover the quinoa with cold water, rinsing it thoroughly. Then drain through a fine mesh strainer. Allow to drain and dry for 20 minutes to remove all the water. Skipping this step will lead to mushy grains. Once your quinoa has dried, toast in a dry pan until you can smell the nutty flavor that has now been brought out in your quinoa, about 5 minutes. This also removes any additional water that may have been left behind by the rinse. Remove the quinoa from the pan, set aside. 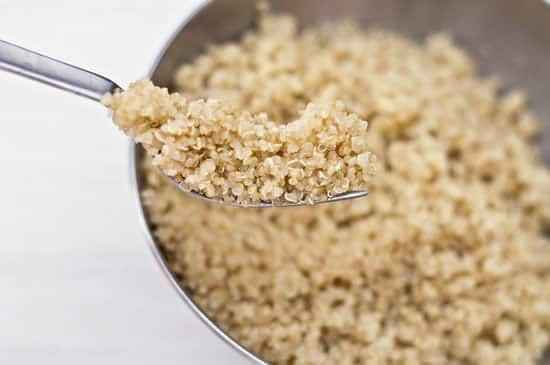 Cooking quinoa with the same liquid to grain ratio as rice (1 cup grain, 2 cups water) is the biggest culprit in the battle for fluffy quinoa. It’s just too much water, and will leave you with mush. Cook instead with a 1 part grain to 1.5 parts liquid ratio. For the purposes of this post, that would be 2 cups quinoa to 3 cups liquid. As for the liquid, you can use broth, vegetable juice, water, or any combination of those to achieve to taste you want. I use at least half broth most often, but for the sake of simplicity, I used water for this post. 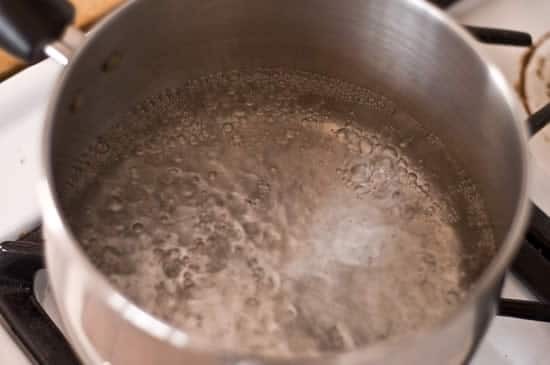 Bring 3 cups of water/broth to a rapid boil in sauce pan. Then add your toasted quinoa and cover the lid with a slight vent, allowing the steam to escape. 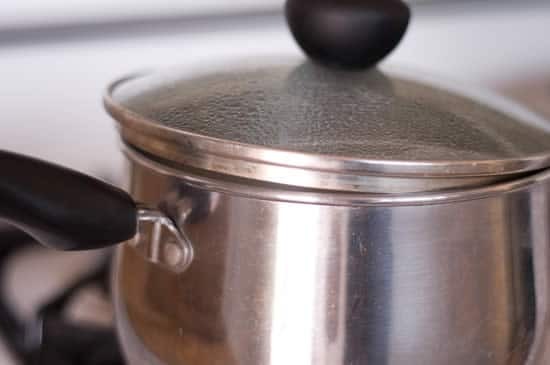 Reduce your heat to medium-low, and maintain a strong simmer. Cook for 16 minutes or until all of the water is gone. Remove from heat and remove the lid. Allow to cool and rest for ten minutes and then fluff with a fork. So what can you do with that nice fluffy quinoa you just made? 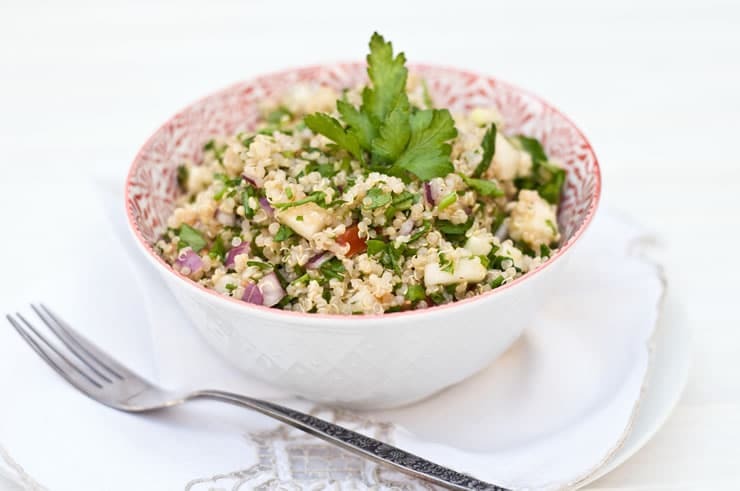 You can make yourself a nice bowl of quinoa tabbouleh! After learning how to make best fluffy quinoa, this is the perfectly delicious meal you should make first! Put all ingredients in a bowl and stir to combine. Enjoy. Thank you everyone! I really am surprised by how poorly written the package directions are in most cases. It took me a while to figure out how to make it correctly but I now make, and eat, so much more now that I know how to cook it right! I have even reduced the water even more (1 cup quinoa to 1 1/3 cup water) and it still turned out great. I think the biggest problem is that more recipes/directions call for way too much water. I learned from Cooks Illustrated to put a clean dishtowel over the pot and then put the lid back on top of the dishtowel after the quinoa is finished cooking and the heat is turned off. Let it sit this way for about 10 minutes. It’s another way to avoid mushy grains. 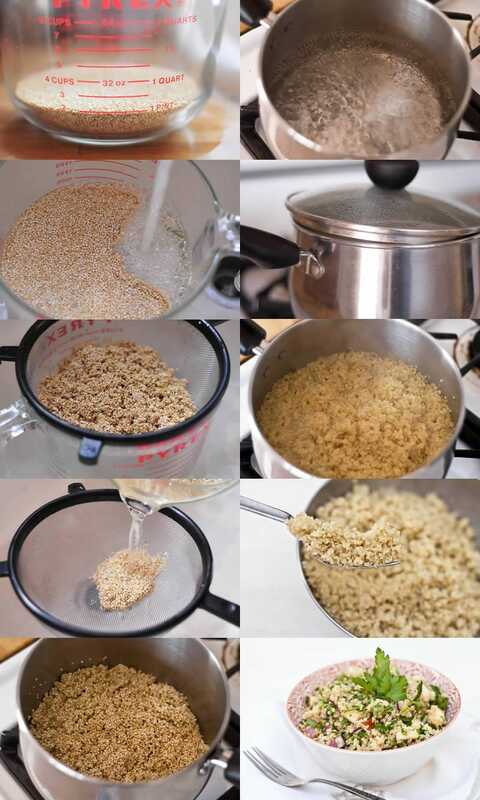 This is the most comprehensive set of directions for quinoa…thank you! Wow, this was really helpful. I was missing some of these steps for prepping and cooking quinoa. I know what to do now. Thank you! Sweet. 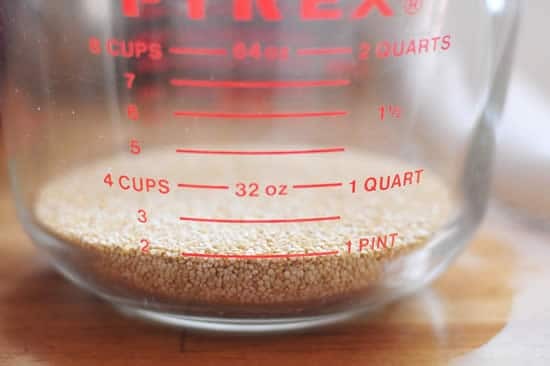 I’ve got a small mason jar of quinoa that was given to me that I’ve been wanting to make. Not much of a fan of tabbouleh, but thanks for sharing a recipe. Any others that anyone will share would be greatly appreciated!